The Khalsa Diwan Society is a pioneer Sikh society formed on July 22nd, 1902 in Canada, America; it was formally established in 1906. 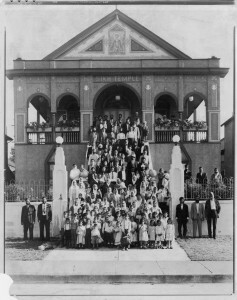 In 1908, the Society purchased and built the first Sikh Gurdwara at 1866 West 2nd Avenue, Vancouver British Colombia (BC) in Canada. The Gurdwara was inaugurated on January 19th, 1908. This is believed to the first Sikh Gurdwara in the whole of the American continent. This Gurdwara Sahib served the Greater Vancouver Sikh community until new Gurdwara Sahib was occupied on April 25th, 1970. The 2nd Avenue property was sold for $100,000 to build a bigger (present) Gurdwara Sahib in Ross Street. It was very unfortunate to lose this historical Sikh monument. As the population of Sikhs rose in BC, the society decided to build a new gurdwara in 1969. The society purchased a 2.75 Acres of Land in 1968 and construction of the gurdwara was completed in April 1970. The new Gurdwara Sahib’s foundation stone was laid on March 30th,1969 at 8000 Ross Street, Vancouver B.C. in the 2.75 acre lot at the corner of Ross Street and S.E. Marine Drive. The construction was completed in 1970 by the Haebler Construction Co. Ltd. at the cost of $433,000. The building of the Gurdwara Sahib was designed and built by a well known architect M/S Erickson and Massey. On November 30th,1969, the 500th birthday of Guru Nanak Dev Ji, the opening ceremony of the present Gurdwara Sahib was performed. Although the building was not occupied until April 25th,1970. The holy Sri Guru Granth Sahib was moved from the 2nd Avenue gurdwara to the new location at 8000 Ross Street on Vasakhi day of 1970. The Khalsa Diwan Society has played a major role in social and economic development of the British Columbia for over a century. The society has been a pioneer in raising Sikhi related issues and getting recognition for Sikhs in Canada. The Society plays a key role in the Komagata Maru affair in the early 1900′s and other major events in BC and Canada. The society continues to work to build a strong community based on Sikhi values and principles. Presently many Punjabi classes are offered in the temple and at various schools in Vancouver; training in kirtan and gurbani is organised for the youth at the temple complex. The society has setup a computer training centre for new immigrants to make them job ready. Many other computer courses are also offered for kids, youth and seniors. Every year the society arranges a Vaisakhi Nagar KirtanProcession and it is witnessed by over 100,000 attendees. Every year the society organizes sports activities including soccer, kabadi and wrestling tournaments. Almost over 100 teams take part in this sports function.